Lithospermum canescens (Michx. ) Lehm. Also Called: Hoary gromwell, indian paint. Stems: Often several, usually simple or sometimes branched near tip, pubescence soft-hairy and mainly appressed; tips erect. Leaves: Alternate, often ascending, lanceolate to narrowly-oblong, .8 to 2.4 inches long, 1/6 to 1/2 inch wide, gray or whitish soft-hairy; tips blunt; primary stem leaves with 1 mid-rib. Inflorescences: Cyme, leafy, densely flowered, terminal. Flowers: Bracts much longer than calyx; calyx 1/6 to 3/4 inch long, lobes 5, narrow, flat, nearly free, 1/8 to 1/4 inch long, soft-hairy; corolla showy, funnel- to trumpet-shaped, 1/4 to 3/4 inch long, to 3/5 inch wide, yellow-orange, not bearded inside at base; lobes 5, entire, 1/5 to 1/4 inch long; stamens 5. Fruits: Nutlets, 1-4, egg-shaped, hard, shiny, cream-colored; each containing one seed. Habitat: Dry prairies, dry open or rocky woods, roadsides; seldom on sandy soils. Uses: The red taproot was used to make a red dye. Native American children would chew the root with gum to color it red and chew gum with the flowers to color it yellow. A compound medicinal tea was taken internally and rubbed on the body to quiet someone nearing convulsions. 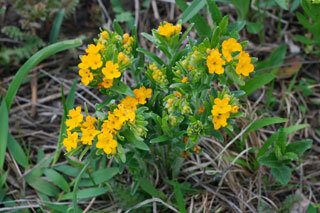 See also Carolina puccoon and fringed puccoon .